On this day just twelve short years ago, we remember and pledge to never forget the acts of September 11 at the World Trade Center in New York. As with all historic moments that change the course of our country's history, those of us old enough to remember will always think of where we were in that instant we heard the news. I was in high school (preparing to present a paper in my Psychology class) and the immediate question on the minds of our teachers, as it related to us, was of how much information to give. Do we turn on the televisions and watch the news unfold? Are the middle schools telling their students? At what age are the students old enough to handle this kind of information? Do we dismiss early so that parents can be the ones to explain what's happening? Now, twelve years later, there are still more questions for those with children and students too young to have known about the attacks as they happened. How do we teach them that part of history that is still so fresh in our memories and in our current world climate? 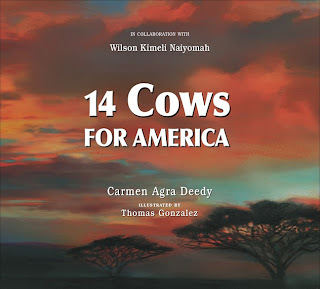 Carmen Deedy's 14 Cows for America is a great place to start. 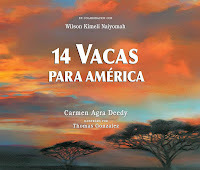 This New York Times Bestseller is a true story of hope and generosity, and the gift a small Kenyan village makes to the people of America. This week, let us look to our younger generation with hope for the future as we discuss with them the importance of remembering the past. If you'd like more information, click here to visit the 14 Cows for America website. A free classroom discussion guide is available here.